Veteran governess Laura Grey joins the Selwick Spy School expecting to find elaborate disguises and thrilling adventures in service to the spy known as the Pink Carnation. She hardly expects her first assignment to be serving as governess for the children of André Jaouen, right-hand man to Bonaparte's minister of police. 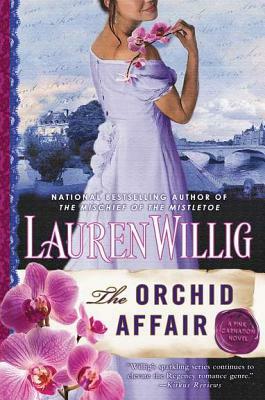 Did you know much about the Napoleonic era in France before reading The Orchid Affair? Did you learn anything about this period of world history? "I had fallen madly in love with my topic… The Scarlet Pimpernel, the Purple Gentian, the Pink Carnation—what's not to love about dashing rogues in knee breeches racing back and forth across the Channel, outwitting the dastardly schemes of the French?" [page 2]. What do you think of Eloise's dissertation subject? Do you share her enthusiasm for it? In considering her larger-than-life parents—and her peripatetic childhood—how did Laura Grey's youth shape her adulthood? What about Laura made her a good spy? Talk about role of social class in nineteenth-century society as it's depicted in The Orchid Affair. How did it dictate Laura's role in the Jaouen household? Did assuming the responsibilities of a governess better allow her to conduct her surveillance of André, or would she have had an easier time if she had posed as nobility? What was your initial opinion of André Jaouen? Did it change as you learned more about him? Of the many revelations about André, what surprised you the most? Are there characters in the book's nineteenth-century France setting—Laura, André, Daubier—who resemble any of the modern characters? What are some parallels that might be drawn between the dual narratives that exist in The Orchid Affair? Many characters in The Orchid Affair engage in forms of acting. What are some examples? Were some figures better actors than others? Unlike the plots of other titles in this series, in The Orchid Affair the identity of the villain is established early in the book. Would you have preferred not to know who the "bad guy" was until the end, and that the mystery unfolded throughout the course of the book? Consider how Laura and the Jaouen family join the traveling theater Commedia dell'Aruzzio as a way to escape from Paris undetected. Is it ironic or otherwise funny that even though she's a trained spy, Laura is a terrible stage actress? Continuing the thought above, are there instances in which Laura assumes a character or a role successfully? What were they? In chapter fifteen, André invites Laura to his gathering of artists. Even though doing so went against social norms, why did he include Laura? Jumping forward to their time with Commedia dell'Aruzzio, did you anticipate that Laura and André would grow as close as they did? Did their coupling come as a surprise? Talk about the genre of historical fiction. What about this style of writing appeals to you? Do you prefer learning about history through fictional characters, or would you rather read a more straightforward nonfiction account? Have you read all the novels in Lauren Willig's Pink Carnation series? Do you have a favorite book? Can you think of any subjects or periods in world history that you'd like to see the author tackle in a subsequent book in this series? Which one would you choose? Why? In chapter thirty-five, Eloise learns that after the Caloudal affair in 1804, André and Laura marry and move to America. She also learns some details about Gabrielle and Pierre-André's adulthoods; did those revelations surprise you at all? How did you imagine the children growing up?